Bertha Gumprich, the author of Vollständiges Praktisches Kochbuch für die jüdische Küche, was born in 1832 in Nickenich, a small municipality in the Rhineland-Palatine region of western Germany. Her father was a merchant. There was no synagogue in Nickenich; instead members of the Jewish community used rooms in family homes for services. 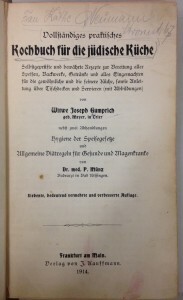 In 1860, Gumprich married the merchant Joseph Gumprichin in Trier, also located on the western border of Germany (Haller and Monz, pages 7-8). Gumprich, Bertha (geb. Meyer). Vollständiges praktisches Kochbuch für die jüdische Küche. 1914 Edition. 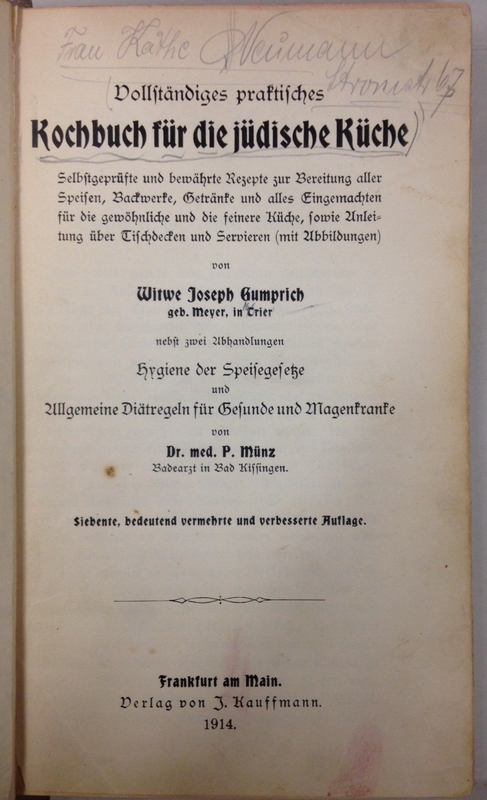 Notice how her name is not used as the author, but instead the line “The Wife of Josef Gumprich” is used. The popularity of Gumprich’s cookbook can likely be explained by its practicality and the extensive varieties of recipes it offers. Much like Rebekka Wolf in her Kochbuch für israelitische Frauen, Gumprich emphasizes the idea that her cookbook could serve as a reliable resource for inexperienced housewives trying to prepare affordable meals that were both tasty and kosher. As Gumprich writes in her introduction, many cookbooks in the 19th century did not provide guidelines for kosher cooking methods and ingredients; or they weren’t practical for “die einfach bürgerliche Küche” (the simple middle class kitchen). Both Gumprich and Wolf created recipes that were timelessly delicious, like roasted duck and stuffed chicken. Each also had dishes that would seem peculiar to contemporary taste buds, like recipes for brains and lungs. Finally, both authors deliver on their promise to provide an exhaustive number of recipes with options enabling dishes to be adjusted for everyday meals or festive occasions within the means of the middle class. For example, each book offers more than 70 varieties of sweet and savory soups, all using standard ingredients. Although dishes like Gumprich’s “Ragout von Kalbshirn, Milcher und Zunge” (ragout made from veal brain, sweetbreads and tongue) might not be considered very mouth watering on today’s menus, the fact that her Vollständiges praktisches Kochbuch was in print for over 30 years proves the book’s popularity around the turn-of-the-twentieth century. Sophie Pataky (ed.). Gumprich, Frau Josephine. In: Lexikon deutscher Frauen der Feder. Band 1. Verlag Carl Pataky, Berlin 1898. Monz, Heinz. Bertha Gumprich, die Trierer jüdische Köchin, vor 170 Jahren geboren. In: Neues Trierisches Jahrbuch. 42. 2002.